Paul joined The Social Golfer in 2014 and has been an active and welcomed member ever since. In 2017, The Social Golfer sponsored Paul and fellow disabled golfer Roger Hurcombe, helping them to fund their competitive golf. Here’s what the BBC wrote about Paul Houghton’s case…. 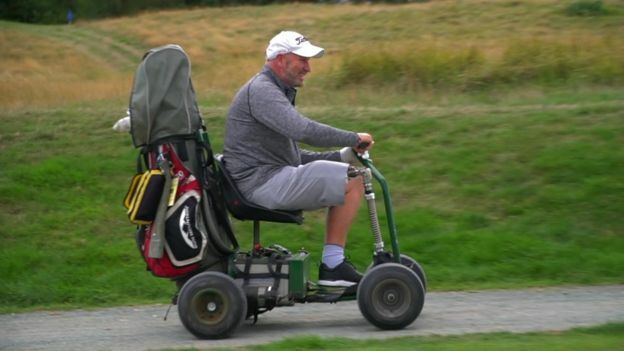 Golfer Paul Houghton who is disabled and who uses a prosthetic leg is suing a local council for refusing to let him play on its course using a buggy. 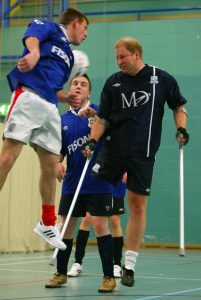 Paul Houghton’s right leg was amputated in 2000 after he was affected by a lethal tissue-eating bacteria. Mr Houghton learned to walk again – and golf became an important part of life but he still also uses crutches and a wheelchair. He claims Brentwood Council in Essex discriminated against him but the council is defending the legal action. Paul is lucky to be alive. In November 2000, while working as a roofer, he knelt in contaminated water and contracted the deadly flesh-eating bug necrotizing fasciitis. It consumes muscle and body tissue at a rate of 0.75in (2cm) an hour. “The surgeon told me he had to operate immediately,” Paul told the BBC. “He said that he had no choice but to continue cutting until he was certain he had removed all the infected tissue. His right leg was amputated above the knee, and he received the last rites in hospital. In all he had five operations, some for skin grafts because his amputation was very rushed and the perfect stump could not be formed. Paul could not continue to work as a roofer and his business was wound up. He requalified and now works for Chelmsford Council as its access officer in building control. He learned to walk with a prosthetic limb and switches between it, wheelchairs and crutches. However, overuse of the crutches causes shoulder injuries, while the prosthetic leg can cause pressure sores that are difficult to cure. 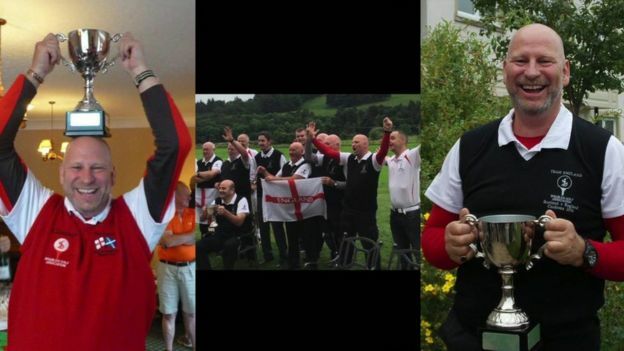 Paul has represented England at disability golf 13 times, with a handicap of 14, and has played on courses across Europe. 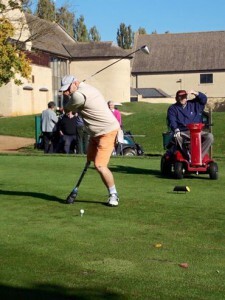 Because of his disability, he needs a buggy in order to play an 18-hole course. 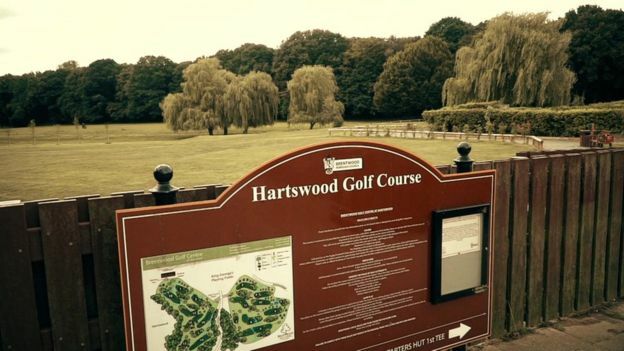 In August 2016, Paul had booked to play a round with a friend at Hartswood Golf Course in Essex. It is owned and operated by Brentwood Council. On his way to the first tee, he claims he was told he would not be allowed on to the course without a letter from his doctor justifying the medical need for a buggy. If he obtained such a letter he was told he would be given a certificate allowing him to use his buggy. “I was gobsmacked“ he told the BBC. Paul says he explained that he had his own insurance, a European Disabled Golf Association card, and a medical exemption, but the club insisted that he needed a letter from a doctor to justify the use of a buggy. “It sends the message that disabled people aren’t welcome, that we are not part of society, not included, but are segregated and can’t join in a sport that’s accessible to everybody, because we need to use other equipment to play the game,” Paul says. In his legal claim, Paul argues that by refusing to allow him to use a buggy without a doctor’s letter, the council discriminated against him because of his inability to walk around the golf course. In effect, he claims the council was applying a policy that indirectly discriminates against all disabled people who need a buggy to play golf. Brentwood Council denies any discrimination and is defending the legal action. The council said it was “committed to ensuring safe access for everyone to all its facilities” and would issue a full statement when legal action had concluded. In its “Buggy Use Policy”, England Golf, the governing body of amateur golf, says it “wishes to encourage the participation in golf of all players regardless of disabilities”. This, it says, is in accordance with its obligations under the Equality Act. There are numerous destinations around the world to visit and play golf but closer to home, have you ever consider golfing in Northern Ireland? Beyond capital Belfast’s five parkland beauties there’s a wealth of inland courses for golfers to play throughout the region. Some of them are at golf resorts where the fairways are just steps away from your room, while others are unsung jewels just waiting to be discovered by visitors. There are three main golfing resorts in Northern Ireland, all of them offering extensive golf facilities as well as accommodation, bars, restaurants, recreational activities – and full-service spas with massage treatments, to help ease those aching muscles after a round or prepare the body for the next golfing foray. Just 20 minutes from Belfast, and only 10 minutes from Belfast International Airport, the Hilton Belfast Templepatrick Golf & Country Club incorporates a 129-room four-star hotel and a par-72 golf course that stretches to over 7,000 yards. Designed by former European Tour pros David Jones and David Feherty, it opened in 1999 and challenges golfers with a mix of lakes and mature trees. Other golf facilities include a floodlit driving range, short game practice area and two practice putting greens. The resort also has a spa and health club, both of which were refurbished in 2014. Located on a 600-acre peninsula between Lower Lough Erne and Castle Hume Lough in the Fermanagh Lakelands, Lough Erne Resort comprises a five-star hotel and the Faldo Championship Course – six-time Major winner Sir Nick Faldo’s first design in Ireland – that opened in 2009, as well as a second 18-hole course, the Castle Hume. The resort also has a golf academy featuring a private golf studio equipped with video and ball-tracking analysis. Lough Erne Resort opened in 2010 and has 120 rooms, suites and loughside lodges. Its Thai Spa offers a dual treatment room ideal for couples, with treatments including a two-hour Golfers Tonic massage. The resort’s Catalina Restaurant is named after the World War II flying boats that were based on Lough Erne. Lough Erne Resort welcomed world leaders including Barack Obama, Vladimir Putin, Angela Merkel and David Cameron when it hosted the G8 summit in 2013. The Roe Park Resort lies in the beautiful surroundings of the Roe Valley Country Park. It is just a short drive from 2019 Open Championship venue Royal Portrush and other top links layouts as well as the Causeway Coast’s world-class visitor attractions, among them the Giant’s Causeway, a UNESCO World Heritage Site. and high-tech indoor teaching studio. in 2017, played at Portstewart Golf Club. Galgorm Castle Golf Club is laid-out through mature wooded grounds in the heart of the 220-acre Galgorm Castle Estate, alongside its 17th-century castle. It stages the annual Northern Ireland Open, part of the European Tour’s Challenge Tour. More than 40,000 people watched the free-to-enter the tournament in 2017, a record for the tour. A new Fun Golf Area at Galgorm is aimed at families and features a six-hole pitch and putt course and the Himalayas putting green, a scaled replica of the famous St Andrews attraction. When golfing in Northern Ireland, the region also boasts several centenarians outside of Belfast. They include: Massereene Golf Club, established in 1895 and offering a challenging course on the shore of Lough Neagh; Newtownstewart Golf Club, founded in 1914 and laid out through venerable oaks and beech trees in the Baronscourt Estate, home of the Duke of Abercorn; Tandragee Golf Club, dating back to 1911 on the Duke of Manchester’s Estate with bunkers including some resembling America’s Great Lakes that were designed by the Cincinnati-born Duchess of Manchester; and Omagh Golf Club, which was extended from a nine-hole course built in 1910 to 18 holes in 1983. 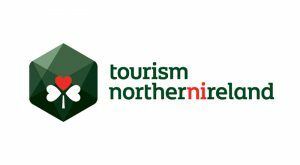 Other gems include County Down golf clubs Rockmount, St Patrick’s, Warrenpoint, Edenmore and 36-hole Clandeboye, County Antrim’s Lisburn Golf Club and Country Tyrone’s Dungannon Golf Club. Several excellent seaside courses lie in the shadows of renowned venues. 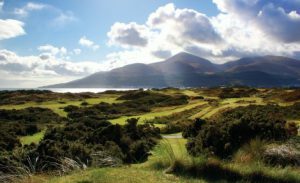 Just around the coast from the celebrated Royal County Down, the short but spectacular Ardglass Golf Club links hugs the rocky shore and cliffs, with several holes offering views across the bay to Coney Island. Golfers can enjoy the craic after their round in the bar of the oldest clubhouse in the world, originally built as a castle over 600 years ago and with cannons pointing out over the fairways just in front. Kirkistown Castle Golf Club, on the Ards Peninsula, is the closest links course to Belfast and was designed by legendary architect James Braid, while Ballycastle Golf Club, a mix of parkland and links, lies opposite Rathlin Island on the Causeway Coast alongside the ruins of 500-year-old Bonamargy Friary. Cairndhu Golf Club is a parkland course with several holes right by the sea, its signature, par-3 2nd hole ending in a green perched on a rocky headland. However, few courses can match the historic connection enjoyed by Foyle Golf Centre, on the outskirts of Derry below the Donegal Hills. Its championship parkland course is named after aviation pioneer Amelia Earhart, the first woman to fly solo across the Atlantic. She made an emergency landing at the end of her historic flight in 1932 on what is now the 6th green of the Earhart Course. Whatever your preference, golfing in Northern Ireland is a hit! There a number of ways to calculate your golf handicap either via a recognised CONGU® Club handicap OR alternatively, golfers can use an Online Golf Handicap Tracking Platform such as the one offered by The Social Golfer. However, be aware that Online Golf Handicap calculations are NOT approved by CONGU® (The Council of National Golf Unions). But how do you calculate your golf handicap? ws players of varying abilities, to play against one another in a fair and equal manner. In short, your golf handicap is….. the number of shots you would expect to take when playing a round of golf compared to a player who has no handicap e.g. someone whose handicap is 0. This is not as difficult as you might think if you take a short time to understand the CONGU® system. If you are a member of a club that is affiliated to one of the ‘Home Unions’ (ie, the governing body for golf in England, Ireland, Scotland or Wales), then you are eligible to have a CONGU® handicap. To get your first OFFICIAL handicap you will need to complete 54 holes of golf (this may be any combination of 18- and 9-holes*) with your card marked by someone who understands the Rules of Golf. (e.g. 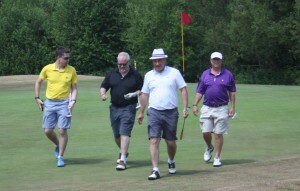 The Club Manager, Club Pro, Club captain, a committee member or another member). Once your rounds are completed the ‘handicap committee’ will consider the scores you have made and, taking into account any previous golfing experience you may have had as well as any other sporting achievements, will ‘award’ you a handicap. Then, every time you play in a qualifying competition your handicap may go up or down. Handicaps are divided into different bands – called categories. Depending on which category you are in, the amount your handicap can go down varies. Also, the amount you can play over your handicap (called buffer zone) varies before your handicap increases. N.B. Everyone’s handicap is calculated to 1 decimal place but their playing handicap is the nearest whole number. If you play ‘below’ your handicap, your handicap will be reduced by a certain decimal point for every shot under (see categories above). However, if you play above your handicap (i.e. more than your expected GROSS Score, your handicap will be increased by 0.1. You are allowed some leeway (this is your buffer zone – see categories above for different buffer zones), but once you are above your buffer zone, your handicap goes up. The Good news is that no-one is expected to be able to play to their handicap for every round. There is some flexibility: if you play within your buffer zone your handicap will not alter. Under CONGU® rules, every time you compete in a competition you should return your card. This is firstly so the competition organiser knows that you have played in the competition and secondly because the organiser may want to check your marker’s score which is on your card. It is against the spirit of the game to put your poor scorecard in your pocket and drive home. As already noted, it is your responsibility to play off the correct handicap. If you believe you have played under your handicap you must calculate your new handicap before playing in another competition. Finally, when moving between handicap categories, the calculation gets a bit more complicated. However, this is when The Social Golfer Handicap System** comes into its own. Just add your scores after every round and let our Handicap calculating system do the rest. Once you have added your scores, TSG PRO account holders can then print off a copy of their TSG Handicap Certificate. So there you have it, no more arguments on the first tee about who’s playing of what handicap! **While The Social Golfer Handicap system is calculated using the similar formula as CONGU®, it is paramount that golfers know that no online handicap system is sanctioned by CONGU® and can therefore not be used in official club competitions. However, Online Golf Handicap Certificates are widely accepted as a ‘proof of playing’ standard by most clubs for casual play. Every golfer wants to know what their real playing ability is but if you don’t belong to a golf club, how do you obtain a golf handicap certificate? Firstly, let’s set the record straight, a CONGU (The Council of National Golf Unions) recognised handicap is the ONLY official way to get a golf handicap certificate. However, in many ways, this is expensive, as it requires you joining a golf club, which can cost you upwards of £600 – £2000 per year! 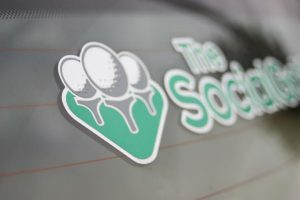 The Social Golfer has its own bespoke Golf Handicap Tracking system, which invites you to submit three of your most recent scorecards, following which it will then produce you an official TSG Golf Handicap Certificate. Thereafter, we recommend members post their scores after EVERY round to maintain their current playing standard. Our system takes into account both your Gross Score and the SSS (Standard Scratch Score) of the Course and adjusts your playing ability accordingly. 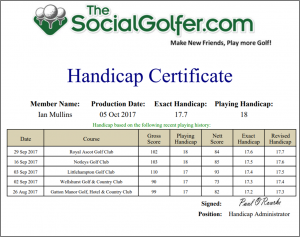 How to obtain a golf handicap certificate – Is it robust and accurate? We recently surveyed our members who are club members with a CONGU handicap and compared them with their TSG handicap and a resounding 100% of those asked, said their handicap on The Social Golfer was LOWER than their Club handicap! How to obtain a golf handicap certificate – Are TSG Handicap Certificates accepted at Clubs and in Open Competitions? Since our launch in 2010, we have never heard of a club refusing our golf handicap certificate either in the UK or Worldwide. However, whilst some Open Club competitions and Golf Society Days will request a CONGU certificate, many clubs are recognising that with club membership on the decline in recent years, that an online handicap is more than an adequate replacement. Furthermore, with Club handicaps only requiring you to submit three scorecards per year (total), the TSG handicap system, calculates your ‘actual’ playing standard after every round. Looking for the birthday or Christmas gift for the golfer in your life? *correct at the time of going to press. Discrimination in Golf – Game takes huge step back…. We know golf is always some years behind the rest of the world in its moral outlook maybe it should have been no surprise, when I recently experienced (in our opinion) a truly awful show of ignorance by my local council toward Paul Houghton – TSG’s very own Disabled golfer. 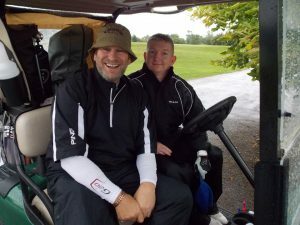 Having got to know some disabled golfers pretty well over the last few years, we stupidly thought discrimination in golf was a thing of past…. 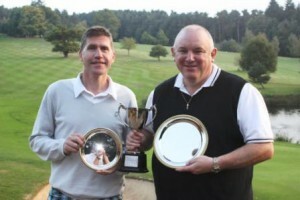 Now and Paul and myself play a couple of times a year together, so was very pleased when he agreed to play at my local municipal course (which is one of the best in the South East). Having extolled the values of this super little course to Paul many times, he may have brought a little too much expectation with him on the day. However, I had no idea what was about to unfold. 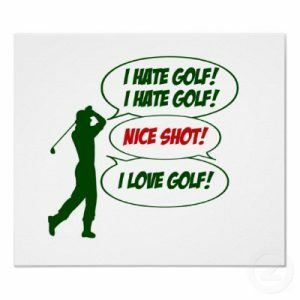 Discrimination in Golf – The Story…. I was invited to play golf at your municipal course by a resident of your borough. This is his local course but he is not a member. On a Saturday in August, we arrived to play at the allotted tee time that we had booked. I introduced myself in the Pro shop and paid for my round. I was told to present my chit to the starter in his hut. As I left the Pro shop the man behind the counter ‘Dave’, followed me out and told me that I would not be allowed onto the golf course using my Electrokart. A little surprised I asked why this was, as I possess my own public liability insurance for the vehicle and possess an EDGA tour card (European Disabled Golf Association) for which I had to have a medical for through England Golf. ‘Dave’ was very quick to reply, stating that without proper paperwork, he could only take ‘my word for it’ that I am disabled. “No, the Council say I must have the proper paperwork before we let you on the course”. You won’t be surprised that my initial response is not printable. Slightly rattled by my determination to not back down and slightly panicked by the thought a lawsuit was already winging its way to his employers…. ‘Dave’ quickly scanned the council website (not the Golf Course website – which has no information!) and stated that all the information was available online. Now the paragraph on the council site is less than clear but does state that a letter must be obtained from the players ‘Doctor’ to justify the use of a buggy. As I am an above knee amputee it seems pretty damn obvious of my impairment (my leg also make a tinny sound when you smack your driver against it) but ‘Dave’ stated that it was a ‘Council’ ruling and I would still not be allowed on the course without the proper documents. (This document would take a matter of weeks to obtain and a Doctor would charge for the letter!). He also indicated that I would be required to cross a road, which cuts through the course which can be dangerous, but surely that is the same for all golfers? So how is this all helping golf to be seen a progressive, accessible sport for all? At this stage, I thought it right to mention to ‘Dave’ that my day job is actually working as a Disability Officer for the neighbouring council and that I know the disability laws inside out. The local council concerned needs to impact assess their procedure in this respect, in line with their Duties towards the Equality Act 2010. What I experienced on that Saturday in August was gross ignorance as to attitudes towards disability, the situation was handled very poorly and much of my day was ruined. As a keen golfer, I have played all over Europe and have never been refused onto a course other when weather conditions inhibit it due to safety. To say I was stunned is an understatement. 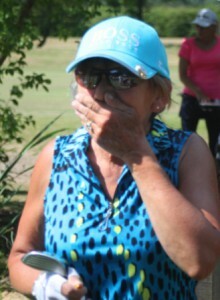 My playing partner and host were more shocked, not to mention embarrassed on his and my behalf! To avoid any more stress for all parties, I decided to cut my losses and asked for my money back, ‘Dave’ retorted that ‘he’ was not discriminating against me. When I said this was ‘blatant’ discrimination, he said you are only saying that because of ‘that’ pointing to my prosthetic leg”. You couldn’t make it up, could you! Discrimination in any walk of life is unacceptable and discrimination in golf turns our stomachs just as much….. Shortly after receiving his email and letter, Paul quickly received the council’s response……they offered him a free round of golf and have asked if could help them review their wording on their website – hang on, isn’t that your job! As all TSG members know, we promote equality and diversity, so to hear and experience a day in the life of a disabled golfer ourselves was a shock, to say the least. Sadly, after four months, Paul is still yet to receive any kind of response or justification from the council as to how they plan to prevent this issue in the future. Paul is considering legal action but that requires a lot of self-motivation – something he would probably prefer to channel through his golf! PLEASE SHARE THIS POST WITH ALL YOUR GOLFING FRIENDS AND LET’S STOP THIS IGNORANCE NOW! For more information on Golf for all, visit England Golf’s Equality and Diversity page. Footnote: Paul lost his leg suddenly sixteen years ago in a work accident whereby his leg was amputated above the knee. However, being the gritty character that he is, Paul decided to take up golf. He later joined the Disabled Golf Association and has now represented his country 12 times, playing of a respectable handicap of 16. He works hard to promote understanding and empathy for disability and hates any form of discrimination in golf! Playing golf socially with friends can be a pleasing experience, add a bit of competition and it makes the experience even more enthralling. Sharing a Golf Buggy with unknown opposition is an entirely different matter! 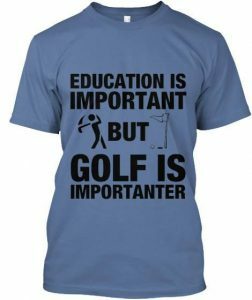 I’ve now been playing golf for a couple of years just monthly, in the society about ten times a year. My handicap has stuck at the agreed 32 mark; I’m not really competing at events but still thoroughly enjoying my new past time. The golf shop in Chelmsford market (sadly no longer there) is a source for new or second-hand equipment. I’ve now secured a set of graphite Mizuno TZoid clubs, a mix and match group of woods and rescues, with a broom handle putter. John the proprietor of the golf shop spots my enthusiasm and tries to assist in me acquiring all the right gear. The putter is his idea, he also states that Henry Cotton had all his clubs the same length something I should consider? This we did, I traded in the Mizuno’s (after a few rounds) for a set of Callaway Hawk Eyes which he fitted to all the same length other than the sand and gap wedge. So it was me who inspired Bryson Dechambeau! Anyhow now clad in my new golfing attire and with the newly fitted clubs I arrived at Burnham Golf Club fit for purpose or so I think. I’m drawn in a group of golfers who were playing off circa 15, so quite handy players. On chatting to one of the players, we discuss why I should have taken an iron on the tee at a par three instead of the rescue, which I have hit too long. It becomes apparent very quickly that I have no idea how far I hit the ball with each club; in fact I am focusing so much on hitting the damn ball, that direction is irrelevant. The respect I have been offered by the society for playing on one leg has waned; quite rightly they think I should be improving from the handicap they gave me. A bit disenchanted I finish the round in a lowly 14th, 3rd from last. One of the group approaches me in the car park, his father is disabled and plays golf regularly. I thought carefully at what has been said…do I take the plunge and join a club, how much would all this cost? Firstly I would need to purchase a buggy and perhaps take a few lessons? I have never had any natural ability at sport, I’ve always had to work hard to achieve anything involving games. I’ve played chess for Essex a game my father taught me at an early age, I studied openings out of chess books, played both Nigel Short and Murray Warren both chess grand masters, but my claim to fame was beating Terry Marsh the fighting fireman. Terry retired as unbeaten Welterweight world champion and was also a very good chess player. As usual, I digress, nevertheless the pep talk from these society members kick-started me into action, I know now that I want to be as good a golfer as I can! So a quick trip onto ebay reveals a single seat golf buggy for sale in Kent, with a few days I am its new owner. Golf buggies for older or disabled players are as important as the clubs in your bag. In fact, a lot of us cannot play the game without the blasted things. The Pro’s: It allows two of you the bliss of being together for 4 or more hours. (Great if you both get on) even better if you hit the ball in the same direction. It can keep the rain off, save you energy; keep you cool and can make for quick golf. They also allow you to carry loads of refreshments, and stacks of golf balls. The Cons: They can be expensive to hire and you may be forced to sit next to somebody you don’t like for four or more hours also the driver maybe so bad that you cannot concentrate on your golf for fear of drowning in the lake the driver did not know existed until you careered towards it, or fear being crushed as you assume the wall of death position, while circumnavigating the side of a bunker while your buggy partner attempts to re-enact the Indianapolis 500. On many occasions, I have considered leaping out away from the runaway death trap while the driver (talking on his mobile phone) hairs toward certain doom, utterly oblivious of the 200-foot drop he is driving towards! Attracting the attention of a golf buggy driver is not an easy affair. I was introduced to ‘Steve’ at the club house, he seemed a decent enough chap and was to be my buggy companion for the day, although I did notice he was chain smoking. Anyhow we were out in the fresh air. Steve apologised just before we set off, that he was a cricket nut and would need to listen to the test match (through headphones) on his Walkman. What he also failed to tell me was he did not have a driving licence! Off we set with clouds of smoking billowing from the exhaust of the machine and from my playing partner Rothmans Super King size cigarette as we back-fired our way down the first fairway. (From the air we must have looked like a damaged Battleship in the attack on Pearl harbour). Conversation was impossible amongst the smoke and noise from the engine, which was as fine-tuned as a dumper truck. That we found our balls was a miracle, the suspension on this bone cruncher, had nigh shattered my eye sockets, my vision was so blurred by the smoke and the lurching ride made me feel dizzy it was like getting off a fairground ride. I went to select my club, bang went the exhaust Steve was off in clouds of smoke like a dragster as Santa Pod, Steve!! The two walking players in this four ball looked over in disgust at the commotion we were making. Steve had played his shot, while being unplugged I managed to attract his attention by wildly waving my arms like a demented Morris dancer. Steve realising that I was stranded clubless, fired up the ‘Mad Max’ sound alike buggy and proceeded to deafen this part of Essex. Through smoke, petrol fumes and the smell of nicotine, I tried to play a good round, it was like playing golf during the Battle of Waterloo. Steve was so engrossed in his cricket, he was not conscious of the commotion we were causing. “100 for two he barked, Cooke’s got a half century”. I just managed to pull my head in a Steve drove us through a Hawthorn bush, it spines tearing at the fragile fibreglass structure. Out came the sandwiches followed by a flask,…”Tea?” bellowed Steve, who was all of a foot away. Is this what sharing a golf buggy is about? He proceeded to continue driving the bone shaking brute sloshing tea from a thermos cup, clutching an egg sandwich in the other hand; his mouth was still puffing on the near dog-ended grout! “FFS Steve!” I screamed you’re going to kill us, he had the look of ‘possessed demon’ in his eyes. We had arrived at the next hole. “Cooke’s got 75 now” he muttered as he left the buggy parked half way up an elevated tee on a 1 in 2 camber. I scaled out of the cabin more like a mountaineer than a golfer! My nerves shattered from this eventful game I succumbed to just getting around the course intact without the need of medical attention. All thoughts of a good golf score were long gone. Just as I started to relax as we puffed along yet another fairway … I felt a stinging sensation on my chest! Looking down I thought I was going to see the tell-tale sign of a black and yellow insect, but to my horror I saw smoke coming from my shirt I was on fire!! “Stop the kart!” I hollered while trying to put out the flame that was now coming from my shirt, Steve looked across and grinned removing the now dead fag from his teeth, “Cooke’s got his hundred”. “I’m on fire you fecking idiot!” I tore his ear-piece from his right ear… pouring water over the coin size hole in my shirt, the smell of singed chest hair hit my nostrils. It was hot ember from Steve’s now dogend fag that had been the culprit. I leapt from the buggy as soon as we came to a standstill rolling on the ground like an agitated puppy. Next month, I finally join a golf club and am confronted with rules and golf etiquette! Paul Houghton is a member at Riverhall Hall Golf Centre where he plays off 17. 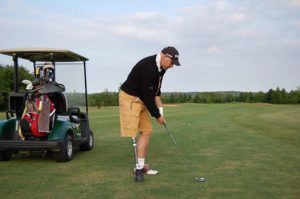 He’s also a member of the Disabled Golf Association andEuropean Disabled Golf Association; he has represented England nine times in tournaments. 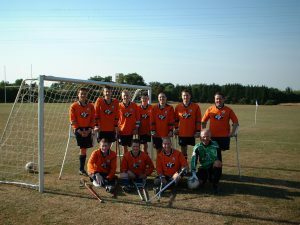 I came to the game late in life re-starting after a 12 year sabbatical and post the rather unusual sport of Amputee Football, where’s he going with this I hear you say…well stick around, it’s going to get a lot weirder I can assure you….. I first came across The Social Golfer when I met Ian (Mr Mullins) at Stoke By Nayland golf Club in Suffolk at a Pro-Am golf tournament that we were both playing in a few years ago. Anyone who knows Ian won’t be surprised to hear that by the end of the round I had joined the Social Golfer, and in return, I had bent Ian’s ear about the wacky world of Disability Golf. I made him laugh with a few of my stories and having stayed in touch Ian suggested I write a blog on TSG after a curry one evening, and share with you all a few of my golfing moments. Some of the names and places have been changed to protect the living; the dead will be rightfully named and shamed. My first introduction to our wonderful game was through my then brother in law. I was in my early thirties, Trevor (Clever) was a few years younger …we were both in the Construction business, myself a roofer, Trevor a decorator. As a young man, my aspirations had been as a cricketer, I even took a job as a Milkman so as to play for Unigate who had a superb cricket team. My claim to fame is that I faced up to the Wivenhoe Express AKA Neil Foster England fast bowler and Derek Pringle also a great cricketer … anyhow I digress. After failing to meet the heady standards set in cricket by Essex in the late 1970’s motorcycles became my only sport of choice until…Clever Trevor remarked at a family occasion that now in our 30’s we should start playing the more sedate game of golf! It’s probably at this point that I should mention that CT has serious anger management issues. (i.e TV & DVD player thrown down the garden when his football team lose, type of issues). Anyhow CT had a friend who had a friend who knew a bloke in a pub who was selling new golf clubs, nudge-nudge wink-wink say no more. The princely sum of £80 secured me a state of the art set of Slazenger XTC irons SW to 3. Add three ‘prehistoric’ woods and a bull’s eye putter I was fit to go. Our first few rounds were torrid affairs at Aquatels in Basildon, this was a nine hole course that accompanied a huge fishing lake, the course was permanently water-logged in fact it was golfing’s answer to the Somme battlefield (to my knowledge the course no longer exists…but the lake is still there). I’d also been given a golf book by Beverly Lewis that helped me to grasp the fundamentals of the grip and stance. After a few sterling efforts hacking around in the mud at Aquatels after Sunday lunch TC and I agreed we needed a more upmarket challenge. So, after more talk, we upgraded to Belfairs Park, still a municipal course but well established and regarded by all a proper golf course. To give you a clue to when this was… Greg Norman was ‘the man’ at this time, having won the open that year (he had also just launched the Tiger Shark brand). On arrival at Belfair’s CT not only was kitted out head to foot in Greg Norman apparel, including white pressed slacks, he had also purchased the Tiger Shark (no slice) driver for the best part of a home mortgage deposit. Belfair’s was to be the ‘Tiger Sharks’ inaugural outing. CT looked magnificent on the Tee, swathed in his newly purchased attire, his white shoes blanched to the condition of a sailor’s cap on the Royal yacht. CT recoiled the Tiger Shark with an over-swing that John Daly would have been proud of. The impact of clubhead and ball was like the crack of a lap-dancers garter. CT’s follow through left him completely off balance, he lurching sideways almost doing a complete pirouette. The ball launched into the air at such a rate it was hard to focus on its trajectory, I glimpsed it just as it veered sharp right and then we heard the unerring sound of a golf ball striking a very solid piece of wood. Belfair’s has a ‘Cathedral like effect’ on sound, voices and golf ball connections are somehow amplified to a much greater degree than normal, it’s the trees of course and CT had hit a big one. CT looked at me for hopeful assurance that his ball was safely in play, not wanting to encourage any false hope; I just mumbled something about ‘not being sure’ and probably best you take another one. Somehow composing himself CT delved into his bag a produced another immaculate Balata, straightening his White Shark cap, placed his provisional ammunition on a tee peg…a slight waggle at address and then back came the gleaming silver no slice club. CT’s neck muscles stood out like huge tree roots his face reddened from the disappointment of his first attempt. Boom the metal headed club thundered into the small white object, the Balata soared into the sky almost leaving a vapour trail, CT’s finish was even less controlled than before completely losing his balance as the expensive driver slipped from his grasp. The Balata was almost out of sight when it veered sharp left and ricocheted off what sounded like three maybe four trees. By this time a small gathering had approached the first tee, CT gathered himself enough to utter those famous golfing word’s ‘That will be OK’? I managed to duff a drive 100-yards down the fairway, we were off. During the round though there was some collateral damage. The ‘no slice’ driver was hurled into oblivion on numerous occasions I retrieved it twice but the third time I think it stayed up in a tree 60 or so feet up. The putter CT had so lovely admired just a few hours earlier on the practice putting green, received the snapping across the knee treatment. A dozen Balata balls disappeared over the first 9 holes; my ‘Ultra’s’ were also diminishing fast. We managed to make it round and into the 19th hole. The language had been pretty fruity at times and CT’s perfect attire now adorned the battle stains of too many visits into the rough. CT and I shared a few more rounds but I never really got the bug for this game, golf with CT was like being in with the opposing supporters at a football match, you just never knew when it would kick off. I put my clubs at the back of the garage; they did not see the light of day again for a dozen years or so until I was badgered into giving this wonderful game another try, more on that next time. Through the grapevine, I hear that CT still plays this beautiful game maybe our paths will cross again someday? Maybe time and age has soothed CT’s rage?? I often smile when I see a guy on the tee kitted out in the latest Calvin Green fashion with the latest driver in hand and brand spanking new Pro V1 perched on the tee, in my head I hear a voice saying go on CT smash it down the middle! Next month, I’ll tell you how this innocent start to my golfing career became an obsession…. Paul Houghton is a member of The Social Golfer and at Riverhall Hall Golf Centre where he plays off 17. 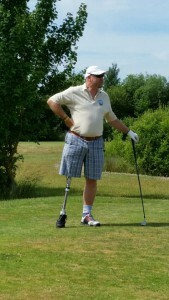 He’s is a member of the Disabled Golf Association and European Disabled Golf Association; he has represented England nine times in tournaments. We’ll having attended and arranged many days ourselves, here our top ten tips for organising a charity golf day or a society golfing day! Arguably the most important decision you will make. The venue should be chosen based on the quality of the course and the green fee/meal cost but also on the location and reachability of your guests. Whilst most golfers (and some non-golfers) will happily give up their day to attend your event, it’s unlikely that they will want to drive more than an hour, so bear this in mind when choosing the venue. Again, a very important decision some will choose to follow the strict CONGU handicap system (which is only available to golf club members) OR you may wish to accept those with an online golf handicap certificate, like those provided by TSG. Alternatively, if you are looking to run a simple ‘fun’ day, then you will have to accept handicaps based on trust. However, bear in mind if you choose the latter, then you may hear the odd ‘Bandit’ shout from some of your attendees on the day. Ultimately, your focus has to be on your guests and those attending. Everything you do on the day goes toward the overall experience. Given that there are normally only a few winners of silverware at the event, it’s important to ensure everyone feels included. The Costs: Consider the amount of money you wish to raise and then work back from there. Make sure your calculation takes into account the cost to your guests and not just yours(!). Think about how far you are making guest’s drive (this is all part of their expenses). Check the cost of playing at the course on a normal day. Take into account the meal bill and of course, consider negotiating with the club. However, don’t be greedy when setting the attendance fee. Too many people when organising a charity golf day, forget that they have to provide value as they are not only giving up their cash to support you but also their time. All too often we hear of golf days being over-priced e.g. £70-80 (sometimes £90+) when the standard green fee is £20. A good guide is to make £10-15 per green fee going to the charity. However, we see no reason why you can’t make a day work at £45-50. The Format: There are many options to choose from including standard Stableford format, Texas Scramble, Team Comp. Putting Comp. and a fun way to keep the group chatting is a Yellow Ball comp. It is worth contemplating playing your golfers of a 3/4 Handicap or 7/8’s. This can be seen as a controversial move but one that is adopted by many organisers, as it levels the playing field and stops the ‘Trophy Hunters’, who ‘claim’ to play off 28 (but are really much better) from spoiling the day. Finally, if you are playing team games and have a spare team of only 2 or 3. You can work around this by taking an average of the 2 or 3 players performance and that score represents the 3rd or 4th player in the team. The Trophies: Will there be one winner or multiple winners? Will there be a separate Ladies comp? Consider adding a Straightest Drive (Longest Drive comp. often excludes many from winning), Nearest Pins, Nearest Pin in Two (second shot), a Secret Six Holes (unmarked on the cards), Beat the Pro and many more. The Four-balls: Arguably the most important decision you will make is who plays with whom. Ensure you have an even spread of playing levels in each four-balls but also consider the personalities. It’s no fun if you are a quiet player if your playing partners are a noisy and chatty bunch – it just won’t work. Equally, it’s important that your day is not ‘cliquey’. So don’t just puts mates with mates. The Fund-Raising: There are many ways to increase your fund-raising outside of the days entry fee. It could be that gathering gifts and prizes to hold a raffle. Perhaps, you can ‘sell’ Mulligan Vouchers for £5 a time to be used on the day. It may also be an opportunity for a local business to add their name to things by way of a cash injection by way of sponsorship in return for some marketing around the event. If you have some special prizes, consider holding an auction. However, don’t let either of these events take up too much time. 20 minutes is a good guide or people will lose interest. Registration: Welcome the guests with a designated area/table where you can confirm their arrival distribute the scorecards (it is often a nice if you have already marked the shots to be given to each player beforehand). The Gifts: Water (if it’s a hot day), give out some tees, a ball marker, maybe a pitch repairer, perhaps a sleeve of golf balls? The Briefing: Prepare a welcome speech and ensure that you have checked any local rules at the golf club hosting the venue. Also inform the players of timings, meals times and if raising money, consider preparing a video to let attendees know where the funds will be going. Marshalling: It is advisable to discuss the marshalling of the players while they are on the course. Arrange for a buggy from the club so you can follow your golfers as they go around the course. ‘Speed of play’ is always a massive issue when organising a charity golf day and make it clear to everyone how to prevent slow play. Photography: If you have the time when marshalling, take the opportunity to photograph your guests (perhaps even take video). Once back at the clubhouse you can then show the images on a TV screen while the players are enjoying a post-round drink and meal. This also provides a great talking point and can create a nice buzz among the golfers. If you have more than 30 players attending your day, ensuring you have enough time to do it. You can enrol the help of the club pro or a good trick is to only ask for cards with scores of 30 pts and above. This will cut down the time you spend checking scorecards and give you more time to concentrate on the winners and any count-back calculations. Have a copy of the main trophy made for the winner to keep. That way they don’t have to take the main trophy home, meaning it never gets lost, broken or worse unreturned! You may decide to add a charity element to your day. There are many ways to increase your fund-raising, it could be that gathering gifts and prizes to hold a raffle. Perhaps, you can ‘sell’ Mulligan Vouchers for £5 a time to be used on the day. It may also be an opportunity for a local business to add their name to things by way of a cash injection by way of sponsorship in return for some marketing around the event. Alternatively, if you have some special prizes, consider holding an auction. However, don’t let either of these events take up too much time. 20 minutes is a good guide or people will lose interest. Let’s not forget, we all like being spoiled and catered for. To ensure your guests know where you are at all times and most of all take time to talk to them. A little conversation from the organiser can give a ‘personal’ touch to proceedings and makes the guests feel cared for and welcome. All the prizes have been given out, the meals finished, the raffle and auctions are over. Make sure you close the day by either asking one of your winners to make a speech, on behalf of the attendees OR summarise the day yourself by making a thank you to all those involved in gathering prizes, scoring cards, bar staff and greenkeepers. You may wish to return to the club in future years and it’s just good manners anyway. It’s no surprise that in the age of digital technology at the fingertips of most us, everyone likes to see photos of themselves playing. So consider distributing the best of these by email after the day, giving you another chance to thank everyone for coming. It also a nice opportunity for you to explain where some of the funds you have raised will be going, this maintains momentum and a feel-good factor for organising a charity golf day in future years. 10. 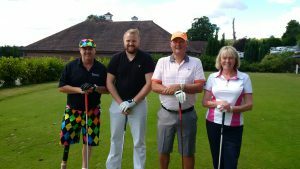 Organising a charity golf day – Enjoy it! Finally, don’t let it become a chore. At the end of the day, if everything runs smoothly you will be feeling proud of your efforts and humbled by having watched so many golfers having a good time. However, don’t let yourself fall into the trap of thinking you can do it all yourself. Don’t be afraid of recruiting volunteers, even if just for the auction and raffles. Raising monies for charity can be both rewarding and fun, so enjoy it! 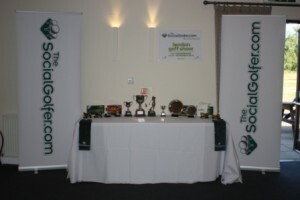 Looking for prizes for your own charity golf day? 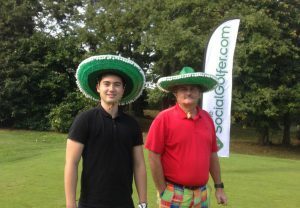 Contact theteam@thesocialgolfer.com and we will happily donate TSG Pro membership’s prizes to your charity golf day! Your driving well, your fairway play is coming on but your short game needs help? It’s time to improve the game from 150 yards and in and learn here how to ‘Chip like Seve‘… are you lacking that magical touch around the greens? – Now lean slightly to your left with your upper body – once you have moved, the ball should now be just behind your sternum – as shown below. This will allow us to make a slightly downward blow onto the ball giving you that crisp, spinning chip. When we chip the ball we want a consistent strike and consistent loft. Both of these help to judge distances as if you get these the same every time, all you have to do is vary the length of your swing to hit the ball different distances. Often this is because the golfer is trying to use the hands and wrists to control the distance of the shot. Not only does this make it incredibly difficult to strike the ball consistently and create consistent loft, but also makes it very hard to get a consistent speed through impact. This happens, as our hands have fast twitching muscle fibres which are difficult to control – especially under pressure! Chip like Seve – Feeling it…. I’d like you to feel like the shaft of the club moves in line with the sternum as you swing the club back. To give an example I’m going to use Luke Donald – sure you will agree – not a bad chipper!! See how the hands and sternum are pointing parallel to each other. This shows the body is more in control of the swing and allows him from here to keep the hands very passive and let the chest turn the club through the shot. Below we can see the finish position where the sternum, club, and hands are all pointing in the same direction. No flip, just a swing controlled from the chest! – Feel the sternum move the club shaft back and through, and FEEL as though they stay in line through out. So there you have it, get down the range and add some ‘Seve Magic’ to your game!